Do you run a mile when you read the cake-making instructions, 'cream butter and sugar until smooth and beat in eggs'? Then, here's the cake for you! 2 Line a 22cm (8-9”) loose-bottomed cake tin on the bottom and sides with baking (parchment) paper. See pics below and instructions here Lining a cake tin. 3 Put butter and sour cream in the bowl of a food processor fitted with a whipping blade (failing a whipping blade, use the chopping blade). Process for 30 seconds. Stop machine and add brown sugar and process for 1 minute. Break eggs into a bowl and beat lightly with a fork to break them up, then add to sour cream mixture with vanilla extract and lemon zest. Process for 1 minute. Transfer mixture to a bowl. 4 Stir flour, soda, salt and cinnamon together, then sift over the top of the bowl of whipped sour cream and egg and fold in using a large spoon. 5 Tip three-quarters of the cake mixture into the tin, spread it out as best you can with a flat-bladed knife, then put in the drained rhubarb. Put the rest of the cake mixture on top in dollops and gently spread over the top of the rhubarb. Sprinkle with brown sugar and cinnamon. 6 Bake for 55-60 minutes in an oven preheated to 190°C (375°F), or until a skewer inserted in the centre of the cake comes out clean. Remove cake from oven and cool in the tin for 45 minutes. Carefully remove sides of cake tin and leave cake to cool completely. Lay a second cake rack on top of cake, invert, remove cake tin base and paper and invert cake on to a serving plate. Serve with a bowl of plain yoghurt or runny cream. 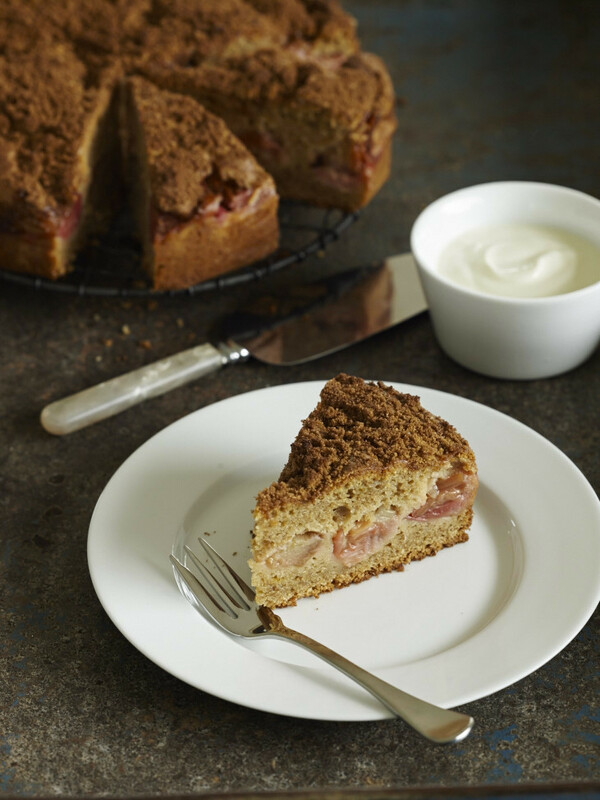 You can also make this cake with apple, or a mix of apple and rhubarb. Use a tangy type of apple like Granny Smith, peel and slice thinly. Made this cake this weekend for dessert with a dinner with friends…was lovely, will make it again! Hi Sue, it’s a great cake isn’t it! 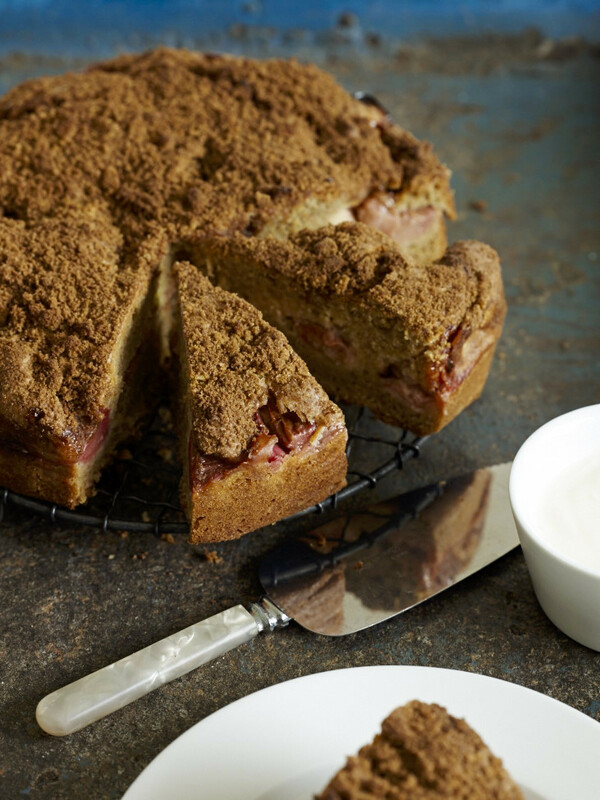 And for a change, if you don’t have rhubarb, you can make it just with apple.